Some call them Koftah, others call them Keftah, but we, Persians, call them Koofteh! 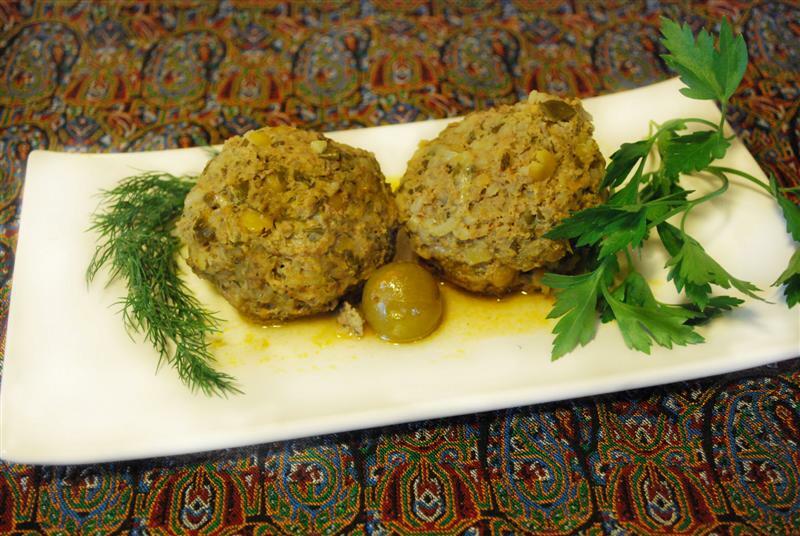 Today’s recipe indeed is for Koofteh Berenji, which is meatballs with rice and split peas. These are seriously yummy and were enjoyed in our house for quite a few days! It was fun experimenting with recipes where I could use the abundance of Gojeh Sabz that I had sitting in my fridge. To be exact this is the second recipe that I made during my cooking marathon along Khoresht Gojeh Sabz. These take a little bit of time as far as preparation goes, but they are well worth it! First things first: wash split peas and rice, add 2 cups of water, a dash of salt and cook for 30 minutes. Clean and wash the herbs. Notice that fresh tarragon is missing here. My local Persian store was all out. I was rather disappointed because tarragon happens to be one of my favorite herbs. But have no fears, I have a substitute coming right up! Also chop the green onions and place them aside. I am partially clever and partially lazy so I thought I could use our food processor to grade the onion. Frankly speaking I was not in a mood to shed some tears. Somehow grading onions is our food processor is not a good option. After seeing the results I might have used two explicit words to unload some of the frustration I felt after the failed attempt. Anyway, I don’t care how you do it, just grade your onion please. Then throw in the herbs and pulse a couple of times for a nice chop chop. The smell of the chopped herbs should make its way up to your nose any minute now! By the way, this is a nice and quick way to chop a large amount of herbs together. I love the food processor for precisely this reason. It might fail its purpose for grading onions, but he is my bestest friend when it comes to chopping herbs, and grading cheese, to think of it! Once the rice and split peas are done, place them in a colander to drain the juices. Save the juice as it will be used as part of the broth. You should be left with about 1 cup of water. Now gather all of the following ingredients as seen in the picture: rice, split peas, graded onion, chopped herbs, ground beef, advieh, and eggs. You will be mixing all these ingredients together in a bowl. If you are going to use a mixer like I did, once again, clever/lazy way, I have found that it is best to beat the eggs and advieh in a small separate bowl first. Regardless of whether you are making this in a bowl or mixer, I have found that it is much easier to first combine the herbs, spices, seasoning, with the egg, and then once these are nicely incorporated add the meat. So moving right along, place the eggs and chopped herbs in the mixer. Add some salt and pepper to taste. Give it a nice mix so that they are incorporated. Add the green onions. Remember how I said that I didn’t have fresh tarragon? Add 1 tbsp of dry tarragon. It is not the same as fresh, but it will do. Give it a mix. Then add the ground beef, split peas, and rice. Mix for about 5 minutes, starting on a slow speed and gradually going higher. If you are overzealous, like I can sometimes be, and go to a fast speed right away, then you will find your counter to mirror mine, where things just flew everywhere. While you are mixing, stop half way through to scrape down the sides of the bowl. Also you might want to scrape the bottom of the bowl as sometimes things just stick to the bottom. Once your mixture is nicely incorporated, make the meatballs, about the size of a small orange. I don’t have a picture of this process as I was home alone and it is a bit hard to make meatballs and photograph yourself at the same time. Sauté the onion and garlic in oil until translucent. This is an extra step that I did because I didn’t have broth and used 3 bouillon. Place 3 cups of water and 3 bouillons in a sauce pan. Bring to a boil. Add the 2 tbsp of tomato paste and mix until both the paste and bouillons are dissolved. One thing that is very important to do is dissolve the tomato paste in either warm water or warm broth. This is something that I learned from my grandma and it is seem to be universal in Persian cooking. Place the broth with tomato paste along with the rice and peas broth over the onions. Check the seasoning of your broth now and make sure that it is just right. Add gojeh sabz and slowly place each meatball in the pot. I should have used a bigger pot, I know! but anyway, partially cover and cook for one hour on medium heat. In the mean time make sure that you baste the meatballs that are exposed on top or gently turned them over half way through. Uncover the pot and cook for another half hour. Thanks for the recipe. Looks good. Question though – how do you serve this? Just alone or with rice or bread or something else? It already has rice in it…so no need to serve it over rice. It can be served on its own with a side of sabzi or salad. It definitely tastes good with bread too. I wrote you once before about how I have been impressing my Persian husband and my friend with my version of your wonderful recipes. Ok, well you will be shocked but I decided to bring some food to my husband’s parents…I made koofteh….and it was the FIRST TIME I MADE IT. Ok, first of all, they loved it. His mom actually asked it she can keep the leftovers and she does not eat leftovers – period. I personally thought I could have made it better – the balls were too crumbly. I realize this happened because when I was mixing the herbs and eggs I added my rice/peas while they were still hot and obviously the eggs cooked long before I formed the meatballs. I knew this had happened but just hoped that it wouldn’t be too bad. Anyway, I just wanted to thank you for helping me impress my mother in law. This is one of the best things that has ever happened between me and her (HAHAHA). Heidi, I can’t tell you how excited I am to hear that not only you have been making my recipes successfully, but now you are impressing your mother in law with your cooking!! I am going to talk about this comment for months to come!!!!!!!!! Keep cooking! Made these for Thanksgiving (GREAT with mashed potatoes, they’re like little meatloaves) and they were came out excellent, thanks for the amazing recipe! I gave some to my friend whose father is from Tabriz, so he naturally loves koofteh. He called me the next day to tell me how good they were, that I need to teach his daughter how to cook, and that his kids were fighting over the last one 😛 I used lentils in lieu of split peas and he noticed that too! the only issue I came across was not rinsing the rice and split peas…when I added the egg it cooked! but all was well:) Just one question though, what is the goje sabz for? Jas, so happy to hear that you made this recipe and that it was a success. The gojeh sabz gives a delicious sour taste to the broth! What is the English equivalent of gojeh sabj? Also if I do not have gojeh sabj can I use something else? Also the broth is chicken rights? Sorry for so many questions, I am very eager to make this dish as soon as I am able to procure all the ingredients…. @ Minu, Jojeh Sabz is sour plums, or green plums. I made this dish today and my husband and I loved it. Thank you very much. The juice is awesome!